Joan Rivers got a bit testy when CNN’s Fredricka Whitfield asked her about the fur she is sporting on the cover of her new book, “Diary of Mad Diva” in a recent interview. The fireworks began! Joan aggressively turned it around on the interviewer, who appeared shocked and incredulous, and demanded to know whether she was wearing leather shoes and said to come back to her when she is wearing a paper belt. (Joan, there are better leather substitutes than paper, silly!) Joan defended herself by saying that the fur she was wearing was killed 15 years ago and that she works for animal rights. Readers, is it ok to wear fur that was killed 15 years ago? 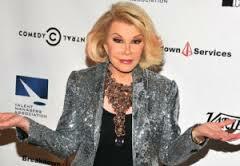 The much-loved and admired comedienne took off her microphone and stormed off the set, in quite a snit! The video clip of the interview has already received over 14 million views. 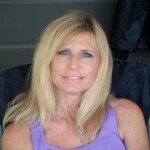 I love her feistiness and her brilliant, abrasive humor. But why did she choose to wear fur on the cover of her book? Hmmm, I must say that it is a curious choice, from the woman who loves to critique other people on their red carpet attire choices. She must have known that she would create quite a little stir with that. What do you think? Any thoughts about Joan and her behavior? Was she being too defensive? Did she walk off because she really couldn’t defend herself? Why didn’t she stay and talk about her choices calmly or was this all a publicity stunt for her new book? It certainly will give her lots of material to poke fun of at on subsequent interviews that will be all over the media. PS If we are only adding to the media storm and giving Joan free publicity by talking about it, then at least it gives us a chance to discuss the idea of wearing “old” fur! Maybe Joan Rivers will give us a little media attention by mentioning how her little meltdown has intrigued Vegan American Princess! Old fur? Does it really matter when the animal was killed? If this was not a media antic by Joan, it surely is a case of someone who could dish it out but not take it! It does seem like old fur isn’t that much different than new fur. Where are the Fashion Police when you need them? Joan’s analogy is as irrelevant as she is. She sure can dish it out but sure cant take it! 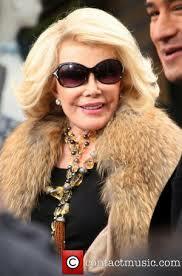 Joan did not storm off just because of a question about her wearing fur…. if you watch the video all the way through, you will see, that the interviewer is goading Ms Rivers with comments like “Isn’t that mean?” And even when Ms Rivers explained that her comments were not personal, but were just comedy… the interviewer kept pushing…. To the point that Ms Rivers left. The fur question, just happened to be among several other points that upset Ms Rivers. I do agree that if you want to ask questions like that about fur, you shouldn’t have a single stitch of animal based clothing in your wardrobe. The fact is, the fur trade is booming again… even former designers that renounced fur, have begun using it again… and the stigma of fur is no longer there…. so to use questions along the line of stigmatizing fur, or implying it’s stigmatization…. when that no longer exists, is simply reaching for shock value, and not informed discussion.